Home›News & Events›Rising Futures: Participation Now! What’s Next? Rising Futures: Participation Now! What’s Next? Delivered in close partnership with Roundhouse, our Rising Futures: Participation Now! symposium was a groundbreaking day exploring ways that young people can be empowered in their own music-making. We brought young leaders and adults from music organisations across London together for key discussions around participation. Participation doesn’t just mean ‘taking part’ – it’s about empowering young people to take a lead in shaping their own musical futures. We discussed ways that young people are already being put at the heart of their own music making, and ways that we can do even more in the future, collectively and as individuals. Watch this space for even more updates, including tools and resources to help you explore your own youth voice practices. 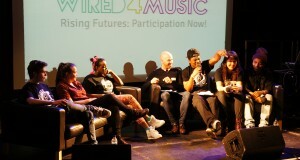 We want as many young people as possible in London to join the campaign and make a pledge: www.wired4music.co.uk/manifesto. If you are an adult or organisation working with young people, click here to discover ways to engage with the manifesto.